On Saturday in Kazan begins the final series of the Gagarin Cup, which will be contested by Ak Bars and CSKA. For the Muscovite Army Men, this is a second appearances in the KHL playoffs final. A mere two years ago, Dmitry Kvartalnov's team took the series to seven games before succumbing to Metallurg Magnitogorsk. For the club from Kazan, this will be a fourth final appearance and a chance to become the first team to win the League's major trophy for a third time. Two days before the start of the final, CSKA Moscow held an open training session, and KHL.ru was there to ask the thoughts of the coaches and players. 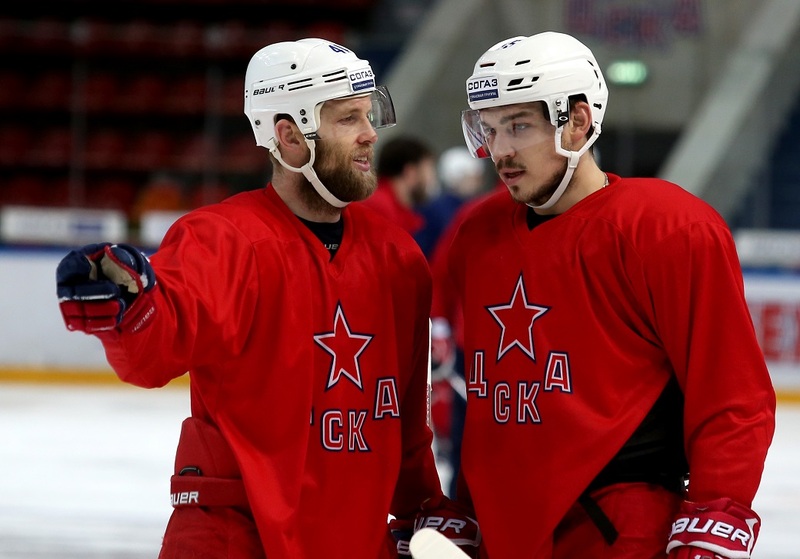 CSKA 's training session on Thursday consisted of many parts, the first of which comprised practice matches involving five teams, with defenseman Nikita Makeyev and forward Nikita Popugayev as “flying skaters”, flitting from team to team. 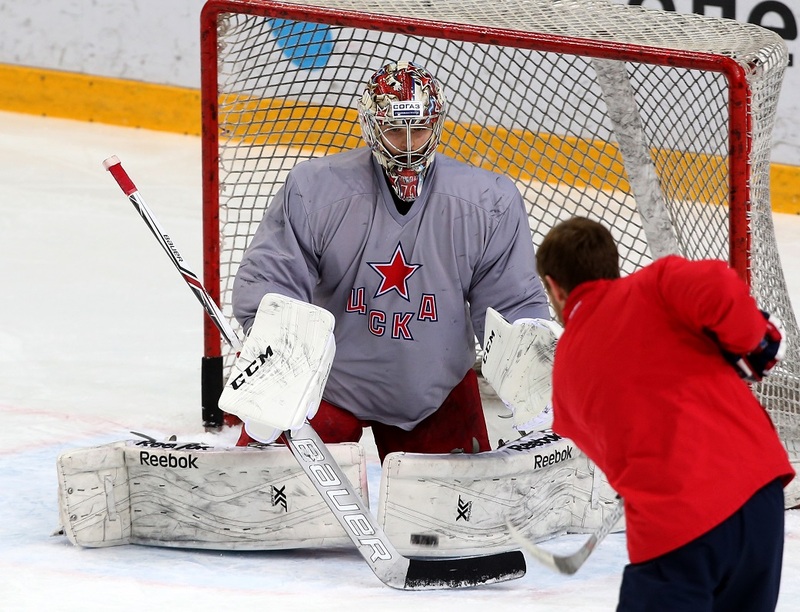 The second part of the on-ice training was practice at uneven strength. Three-time Stanley Cup winner Sergei Fedorov, who previously held the position of General Manager at the club, continues to help the team out in training. Onto the ice stepped two of the team's leaders: defenseman Mat Robinson and forward Kirill Kaprizov, both of whom missed the sixth game of the Western Conference final series against SKA. Dmitry Yushkevich, senior coach at CSKA, assured the assembled reporters that both men will play a role in the forthcoming final, but as for when, it was too early to say. – We'll definitely see Kaprizov and Robinson. It is too soon to say when, but we intend to take Kaprizov with us to Kazan for the first two games, – Yushkevich said. Another of the recent walking wounded, forward Ivan Telegin, who only played in the first two games of the series against SKA, is now back to full fitness. He will be hoping to repeat his performances of two years ago, when his superb displays in the knockout stage earned him a call-up to the Russian national team for the World Championships. – I'm now in the best of health, – said Telegin. – The experience of our defeat by Magnitogorsk in the final two years ago should help us, as we have to learn from our mistakes. Now we face Ak Bars, which is a highly disciplined team. I think you will get some entertaining hockey. Not ten goals, of course, like in our last match of the regular season, although ... anything can happen. In the series against SKA, the biggest revelation was CSKA's Swedish goaltender Lars Johansson, who did not allow a single goal against the reigning champions. His shutout series now stands at 198 minutes and 32 seconds, and in order to break the record for the Gagarin Cup, he only needs to remain unbeaten for single period. – Who is playing in goal? We'll let it be a surprise, – Yushkevich continued. – Making the selection is no tougher than usual. Both Lars Johansson and Ilya Sorokin have been in superb form, both deserve to start the series, and this is a pleasant problem to have. We still haven't decided, and we'll make the choice before the game. With Sorokin all is well, he's ready, and eager to join in the battle. Yushkevich once worked on the coaching staff of the Russian national team alongside current Ak Bars head coach Zinetula Bilyaletdinov. The CSKA coach is sure that his team should expect the unexpected from the eminent specialist. – I'm 100% certain that Bilyaletdinov will spring some surprises on us. Vladimir Vladimirovich Yurzinov said Zinetula Khaidarovich (Bilyaletdinov) is planning some for us. Whatever has happened before is in the past. The Ak Bars guys play differently now, they produce good, solid hockey, – Yushkevich said. At the dawn of the KHL era, Ak Bars won the first two Gagarin Cup finals, and back then the team boasted a certain forward by the name of Kirill Petrov, now part of the CSKA offense. For him, this final will be a special occasion, although he is keen to play down that aspect. - Back in those days, I didn't really play very often. I was still young, and I wouldn't say I made a huge contribution to the team, – said Petrov. – I know a lot of the guys in their team, and I get on fine with them – Alexander Burmistrov, for example. I haven't made any bets, and why should I? A trip to Kazan is nothing out of the ordinary for me, since I often visit the place. In the regular season, the teams played twice and exchanged home wins. In Moscow, on the 17th of November, CSKA managed to shut out the Kazan Men and recorded a 3-0 victory, while the return in the Tatarstan capital turned out to be one of the most spectacular matches of the season, with the Kazan Men defeating the Army Men 6-4. – The first game will be like being on reconnaissance, a getting-to-know-you exercise, There is a good chance of taking your opponent by surprise, but it won't prove decisive. As the series progresses and the opponent grows more familiar, chances of surprising them vanish and the games get tougher and tougher. You won't catch anyone with his pants down in the final. Yes, we've thought about how we might stop Justin Azevedo. But in general, the main thing is to get straight into battle first, and ask questions later – Yushkevich concluded.